The depth and sincerity of this wonderful review and article by Mark Werlin - November 29, 2015, on the Marc van Roon Trio cd "Quantum Stories' is very inspiring to me. I recommend to download the pdf with the review/article hereunder. Or click the link to the HRAudio.net website. 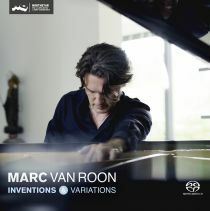 In the work of pianist Marc van Roon, the historical tension between free jazz and structured composition poses no quandary: he stands calmly in the classical-influenced stream of jazz pianism. His work with the European Piano Trio and with saxophonist Tineke Postma (as a pianist and record producer) fall into the modern mainstream. He cites as musical influences post-conservatory studies in the USA with the great Detroit bebop pianist and pedagogue Barry Harris and the ECM artist Richie Beirach. The New York/New England lineage of Bill Evans, Steve Kuhn and Keith Jarrett is evident in van Roon's lyrical phrasing and facility with alternate chord substitutions. He is unapologetically a professional jazz musician, and a creative story-teller who in addition to playing and recording music leads business and educational seminars. The title of the SACD conveys the importance of stories in his life and music..."
"...The music of "Quantum Stories" is uncompromising, skillfully performed and emotionally engaging. In an era when mainstream musical production caters to short attention spans and the demands of fashion and visual media; in a business climate where record labels expect that consumers will have neither the patience nor the curiosity to encounter new creative music; it is reassuring that Marc van Roon and Challenge Jazz remain committed to the unpredictable, neverending story of jazz. European contemporary jazz in hi-res is becoming more widely available through downloads, but is not as well-represented on SACD; this disc belongs in the collections of all SACD jazz enthusiasts...."